Ukiah is derived from the native Pomo word Yo-kayo meaning “deep valley.” The east and west forks combine to form the Russian River in the Ukiah Valley. The river has meandered over its floodplain for thousands of years. Since the construction of the Coyote Dam on the east fork in 1959, the Russian River has undergone significant changes. The dam holds back both water and sediment, causing the river to erode its bed and banks and incise (entrench) into its floodplain. The Russian River has entrenched over 18 feet in the Ukiah Valley. Bank erosion and loss of riparian trees are common parts of this change, as is erosion up tributary creeks and a reduction in groundwater levels. Numerous streams feed into the Russian River in the Ukiah Valley, including: York, Hensley, Ackerman, Mill, Howell, Morrison, Parsons, Robinson, Orrs, Howard, Gibson, and Doolin Creeks. Steelhead trout must swim from the ocean up the Russian River all the way to Ukiah and then upstream into the canyon portions of these tributary creeks to spawn. Ukiah Valley has been an agricultural area for over 150 years, supporting fruit orchards, vineyards, dairy ranches, and cattle and sheep operations. 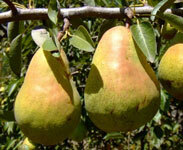 Currently the Ukiah Valley is a winegrape region, and has over 2,000 acres of pears and many acres of grazing land. When flood waters are released from Coyote Dam the river banks become saturated and then slump when releases stop. This family farm of 160 acres straddles McClure Creek from its mountainous headwaters across its alluvial fan. Through their participation in the Fish Friendly Farming program, brothers Vincent and Rory Bartolomei are revegetating parts of McClure Creek. These sites, operated by well-known grapegrower Andy Beckstoffer, both border the Russian River. A large portion of Redemeyer Ranch has been certified as organic. This 100-acre site borders the Mill Creek alluvial fan. Ed Berry uses soil conservation methods, such as cover crops and road winterization practices, to prevent the delivery of fine sediment to Mill Creek. 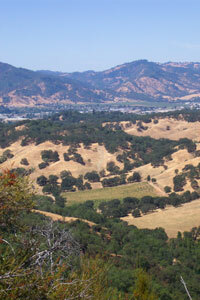 This 165-acre site is an organic and biodynamic vineyard interspersed with oak woodland. Hedgerows of flowers support beneficial insects. This 32-acre vineyard borders Howell Creek and uses cover crops to protect the soil from erosion. 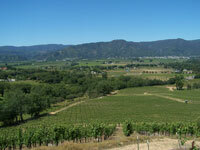 Two Venturi Vineyards sites totaling 28 acres are being managed for water and soil conservation. 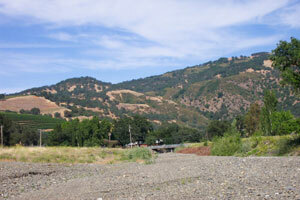 This 160-acre site borders Morrison Creek and the Russian River. Organic cultivation practices are used and a native plant revegetation project along Morrison Creek was completed in 2002. In 2007, Haiku Ranch received an FFF award recognizing Outstanding Efforts in Stream Habitat Improvement and Restoration. The Hildreth Farms—Babcock Ranch (30 acres), Home Ranch (80 acres), Ledford Ranch (50 acres), Robinson Ranch (38 acres), and Scott-Williams Ranch (68 acres)—total 266 acres in the Ukiah Valley with both pear orchards and winegrapes. Each farm has a range of soil and water conservation practices as well as low chemical use. Mike Hildreth uses an IPM program for pears using pheromone disrupter lures against coddling moths in his orchards, reducing the need for insecticides. Robinson Creek borders one Hildreth Farm site and is managed by planting native riparian species. This site, planted with grapes in the 1970s, has been farmed organically since 2000. Peter Johnson manages his family’s pear orchards with low chemical inputs and the IPM program for pears using the pheromone disruptor system. Doolin Creek and the Russian River border the orchards and vineyards. Natural measures are used to address bank erosion on the river. The King Farm, located on the eastern side of Ukiah Valley, stretches from the Russian River to the ridgetop covering 1,500 acres. Owned by the King family, which has farmed since 1919, the property has 45 acres of vineyards. Cover crops are used to protect soil and water quality. 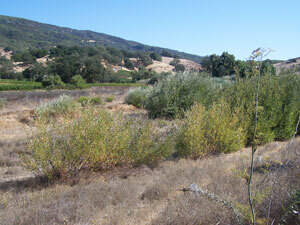 The remainder of the property is wildlife habitat and open space, with minimal grazing. The King family is well-known for its environmental land stewardship and enhancement of wildlife habitat. 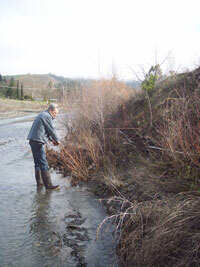 The late Malcolm King envisioned restoring the riparian corridor along the Russian River on his property and as part of the Fish Friendly Farming program, his wife Janet King and daughter and son-in-law Becky and Steven Koenig completed this vision with the largest single restoration project in the Russian River area. 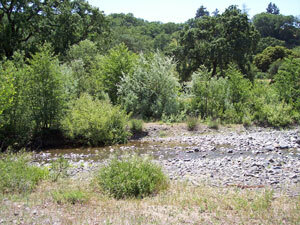 An 8-acre riparian restoration project was completed along the Russian River. The King family's long-term excellent land management, care for wildlife and the Russian River has earned them a distinction as the 2003 Fish Friendly Farming Outstanding Land Steward of the Year in Mendocino County. Larramendy Vineyard change text This 27-acre family farm includes 20 acres of vineyard managed with cover crops to protect soil and water quality. This 59-acre site on Robinson Creek is managed with soil and water conservation. Mike Milovina cares for the creek along his property by removing invasive non-native plant species like blue periwinkle and giant reed (Arundo donax). See also Milovina Vineyards—Largo Ranch. 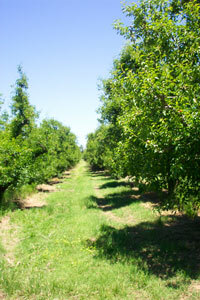 Norgard Farms includes two sites with a total of 170 acres next to and near Mill Creek. Tim Norgard manages winegrapes with cover crops and no-till practices. Arundo donax, an invasive non-native grass, has been removed from Mill Creek along these properties, and native willows have been installed. The Ruddick Ranch of 327 acres encompasses both pear orchards and vineyards stretching along Howell Creek and the Russian River. Chris Ruddick manages the pears using an IPM program for pears with pheromone disrupter system which affects the mating habits of the coddling moth. Insect monitoring then allows the farmer to determine locations where the insects are a problem and treat only those areas of the orchards, resulting in a reduced use of insecticides. Chris plants willows along the river bank to increase stability in this area of the Russian River, where there are high levels of bank erosion. This 13-acre vineyard uses soil and water conservation practices. This ranch stretches over 745 acres from Morrison Creek to the ridgeline. 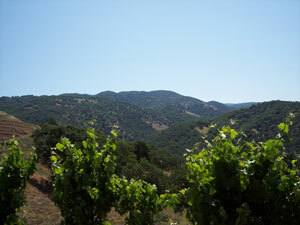 The vineyards occupy 150 acres, leaving a large area of wildland. Morrison Creek is managed by planting willows and alders along the banks and allowing the creek to undergo its natural processes. Steelhead trout spawn and rear upstream in Morrison Creek.